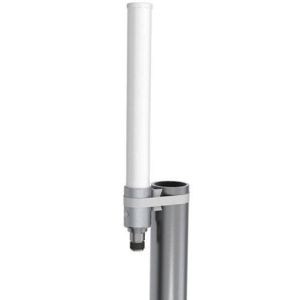 The OC69271 antenna is a wide band omnidirectional antenna covering the domestic LTE700/Cellular/ PCS/AWS/MDS, WiMAX 2300/2500, and global GSM900/GSM1800/UMTS/LTE2600 bands. The antenna can be used in both indoor and outdoor applications. It comes complete with mast mounting hardware and includes a UV stable radome enclosure that provides years of use without degradation to either mechanical properties or aesthetics. The antenna includes no cable. For a cable run of 20'-40' you can use our one of the WPS-240 Extensions below. These are designed to hook up to a booster or modem with a SMA/Female connector. For longer runs, we suggest using one of the below lengths of Ultra Low Loss LMR-400 Cable. This cable is fairly stiff so if you plan on connecting the antenna directly to your phone with an antenna adapter we suggest you also include an 5' RG-58 extension. The below cables may also be connected together using the N-Female to N-Female barrel connector.